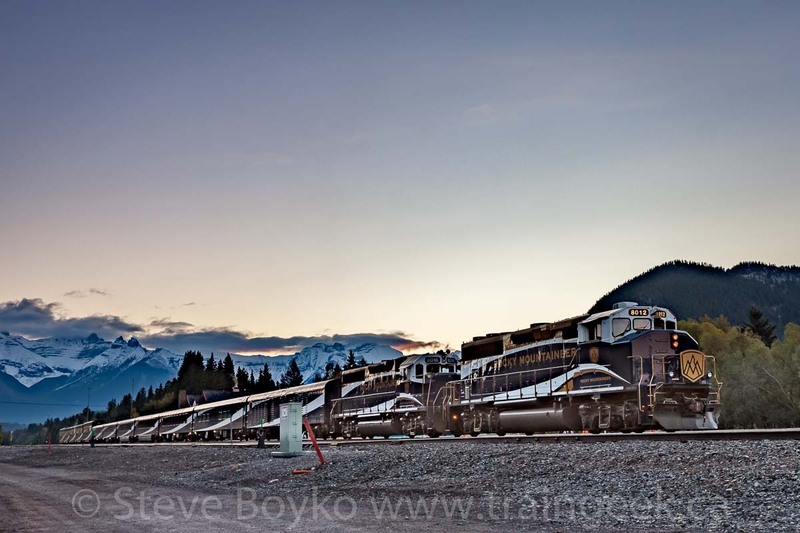 I awoke early on day 6 of my 50th birthday trip to Alberta and British Columbia to go see the Rocky Mountaineer. 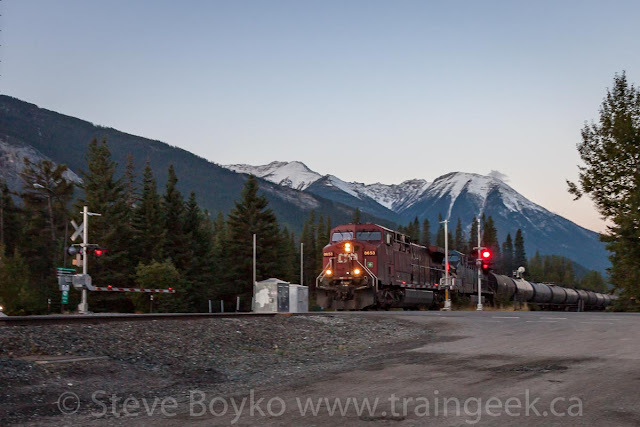 You may recall I tried to see it the previous evening but got distracted by an unexpected Royal Canadian Pacific. 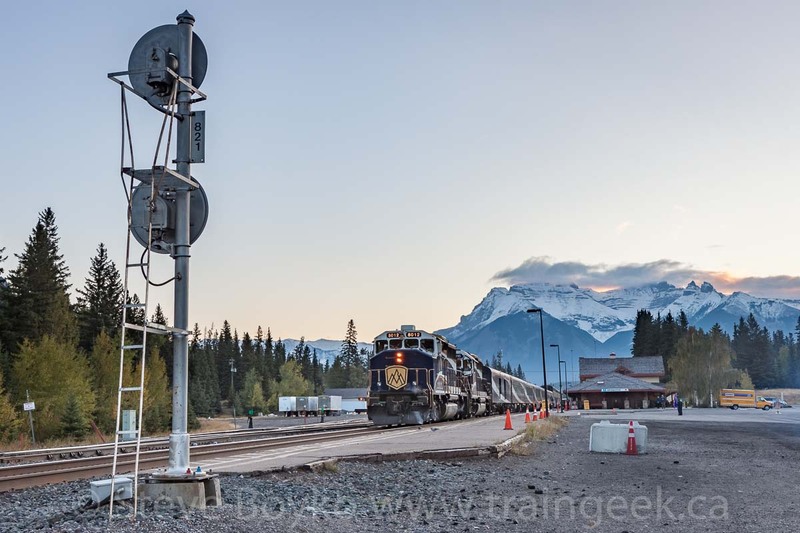 At 07:35, RMR 8012 and 8016 were idling in Banff at the head of about a dozen cars, facing west. The sun was about to crest the mountains, making the light a bit challenging for photography. I shot a series of 3 bracketed photos to merge into an HDR photo to do the best I could with the light. What does all that mean? 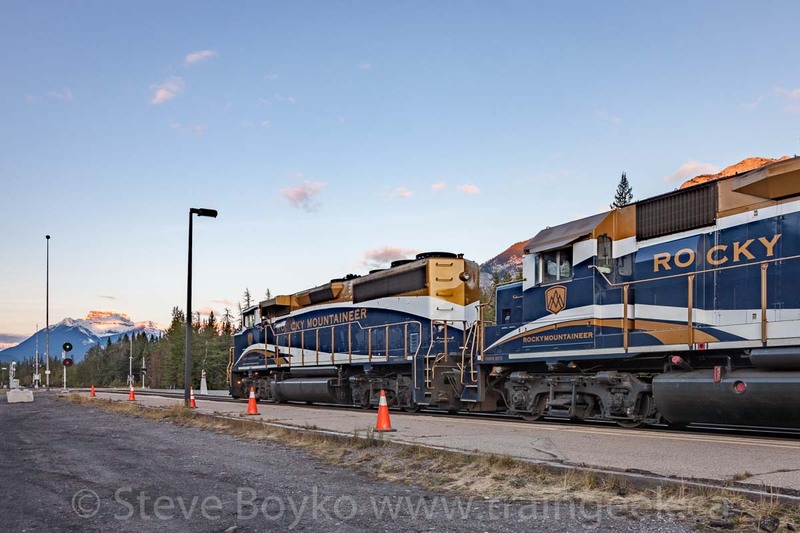 Well, the problem with photographing into the sun (like the lead photo) is that the sky is bright but the train is dark. You can set the camera's exposure so that the sky is properly exposed but then the train is just a dark mass. Alternately, you can set the exposure brighter so that the train is properly exposed, but the sky is too bright and becomes pure white. Neither is good. When nothing is moving, you can shoot a "High Dynamic Range" photo by photographing the exact same scene with different exposure settings. In the above trio of photos, you can see the sky is OK in the left one, a little dark in the middle one, and totally blown out in the right. 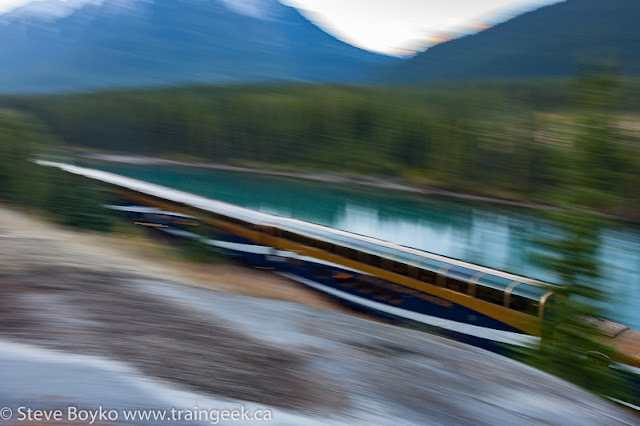 The train is a dark blob in two of the photos and nicely exposed in the right one. What HDR, or exposure blending, does is to merge these photos into one, taking the best of each photo. Here's the result - with some cropping and a bit of editing. 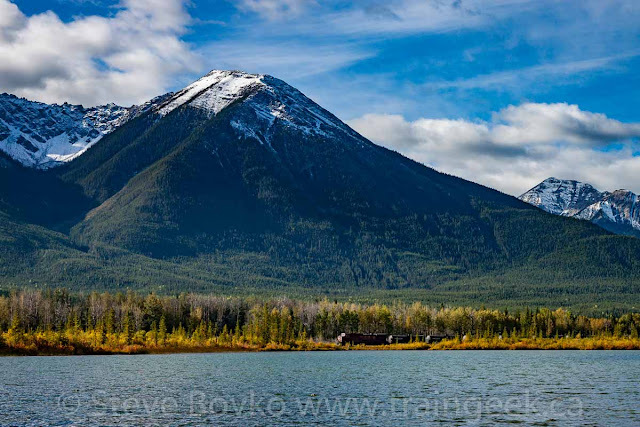 There are specialized programs to do this HDR processing, or you can do what I do and use Adobe Lightroom's built-in HDR processing. I've been doing a lot of HDR photography with static trains like this, or landscape photography. Anyway.. back to the story. 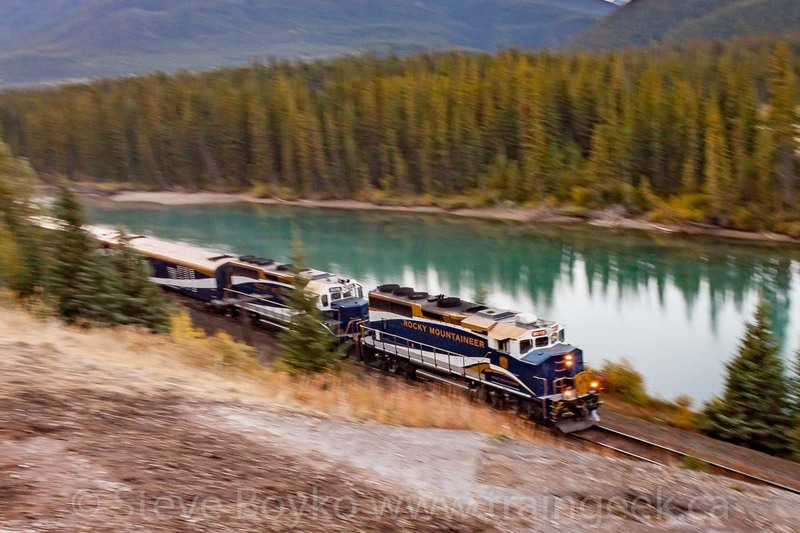 Before the Rocky Mountaineer could leave, it had to meet an eastbound CP freight train. CEFX 1053 was the trailing unit. The crew of the Rocky Mountaineer were out to give the train the rollby inspection. 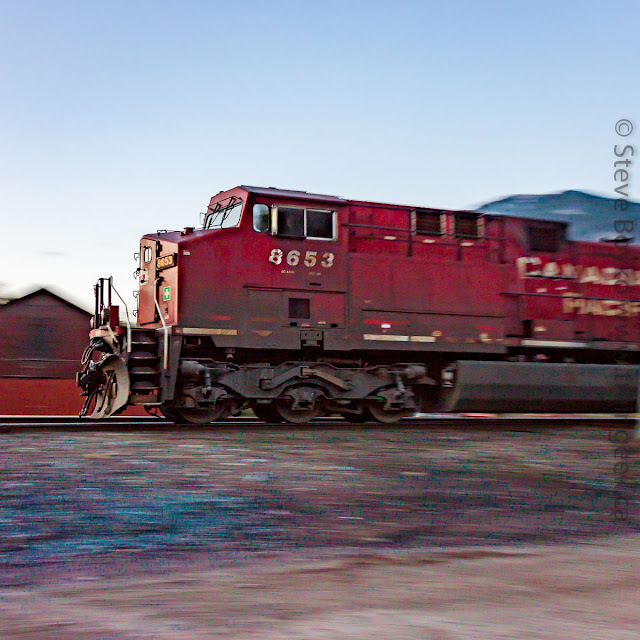 This train had a mid-train locomotive, CP 8821. More panning! This time I used 1/10 second for the shutter speed. I usually photograph in manual so I am using the dial on my camera to spin shutter speed up and down as the train goes by, depending on what type of shot I want. After the Canadian Pacific freight train passed, the Rocky Mountaineer got the green light to head west. I took a few more photos of the train then beat it west to try to catch it en route. My intention was to get them at Muleshoe or thereabouts. I had photographed the Rocky there twice before and I like the spot very much. Unfortunately, I screwed it up royally. I was far too casual about getting to the spot on time. I got to the location in good time, but I ambled down toward the track like I had all the time in the world.. of course I did not have much time. I heard the train coming while I was still walking toward the track, so I had to run while fiddling with camera settings and also keeping an eye out so I didn't trip and fall. 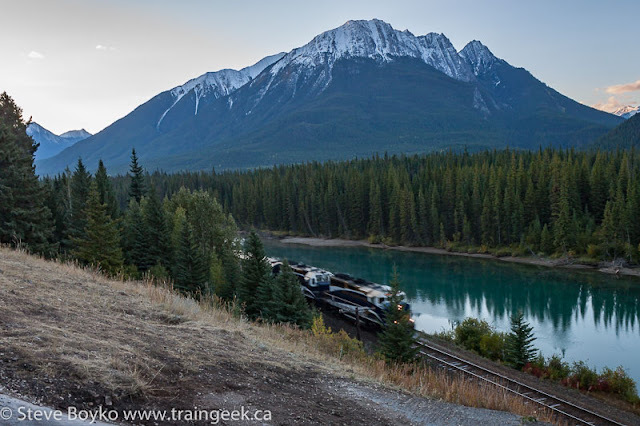 Nice mountain.. but the train is hiding behind a tree. This one, two seconds later, is not too bad. It's definitely the best of the series I took. The rest of the train was a surrealistic smear of bad pans. I'm grateful that I got one half-decent photo out of the series. After that hot mess, I went back to the hotel and met my wife for breakfast at the Ricky's All Day Grill attached to our hotel. Good food at decent prices. 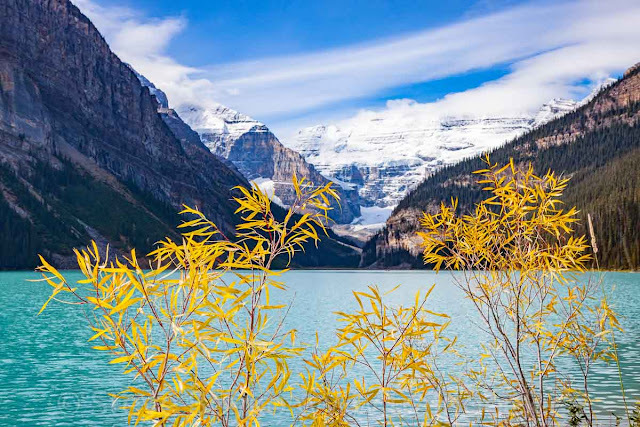 After that, we did get to Lake Louise. We parked in the overflow parking and took the shuttle bus to the lake. We walked to the other end of the lake and it was such a lovely day for a walk. I can't get enough of Lake Louise. That was really the end of my railfanning trip. For the rest of day 6, and the start of day 7, my plan was to not plan and follow my wife's lead. We wandered around Banff, visiting the Banff Springs and the waterfall behind it, and of course some shopping. 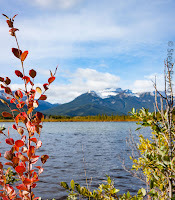 We have been to Banff several times but we never made the drive to the Vermilion Lakes, so I suggested that we should see them. They are just outside Banff so it's an easy visit. Mid-morning on day 7, we drove along the road beside the Trans-Canada for a while, parked and walked along one of the many paths. It's quite lovely there and it's a peaceful retreat from the crowds in Banff. As we were walking along, I heard the hum of an approaching train. A little telephoto work revealed CP 9706 crawling along the shores of the lakes. The train looks pretty small compared to the mountains! That was the last train I saw on the trip. 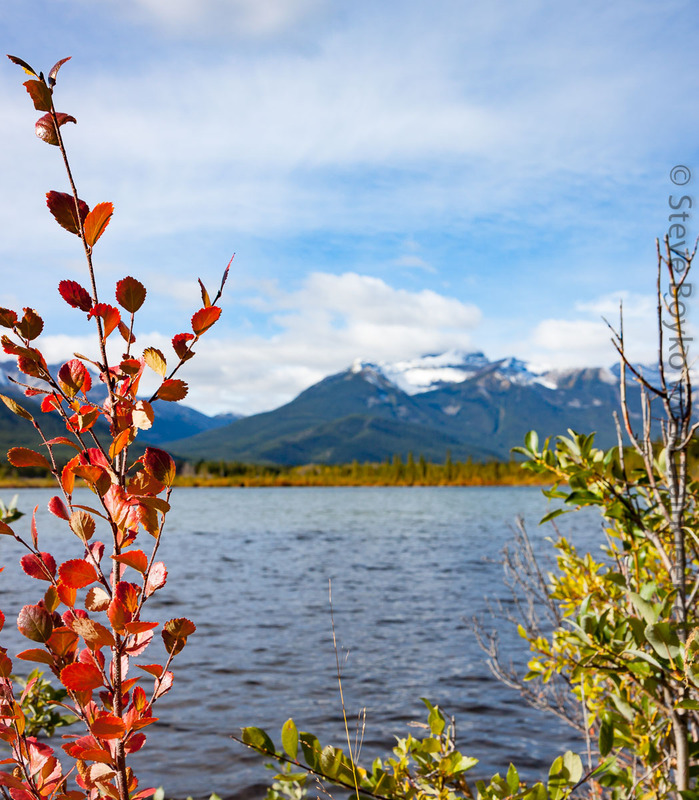 We drove around a few other locations near Banff and then headed into Calgary to the airport for the flight home. 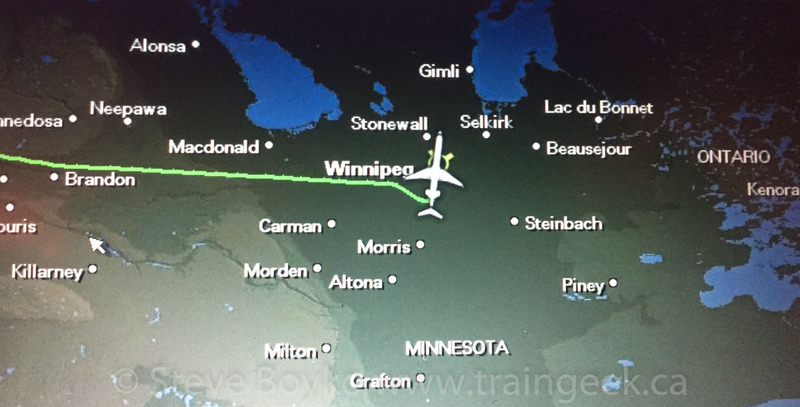 It's always fun to see little Piney, Manitoba on the Air Canada in-flight maps. I still remember the Piney train station. I am so grateful to have been able to make a trip like this... I'm grateful that I could afford the time away from work and my kids, and the money to pay for gas and food and lodging. Most of all I am grateful to have a wonderful wife who supported my idea. 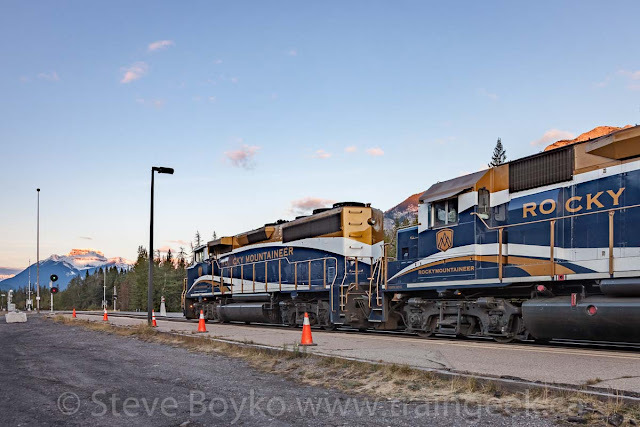 She's a great travel companion, on railfan and non-railfan trips, and I love her so much. Now That is a trip. Our family went to Vancouver and back on the Super Continental and the Rockies were facinating to this flatlander. You really captured them beautifully. Thanks for the HDR explaination... wonderful what you can do with digital photography if you have to.